Because of its unique qualities and natural fibers, as full grain leather upholstery ages, it gets softer and more supple. Instead of looking tired, our leather upholstery looks more interesting and inviting. 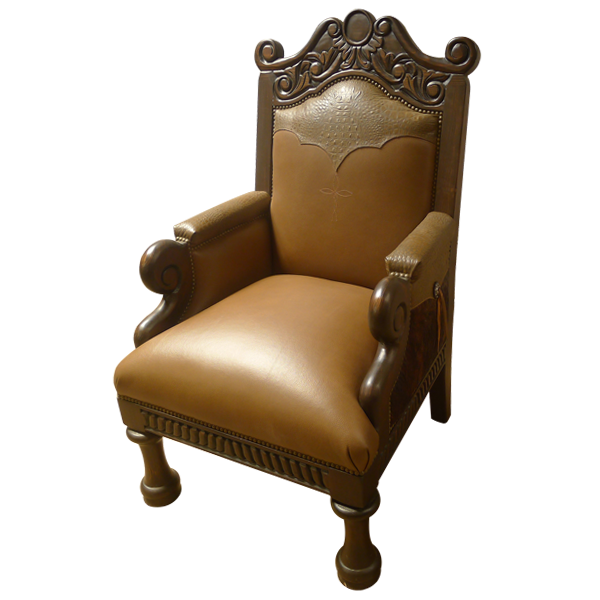 The seat, part of the armrest, and the lower inside seat back of this lovely, handcrafted wingback chair are upholstered in ochre colored full grain leather. 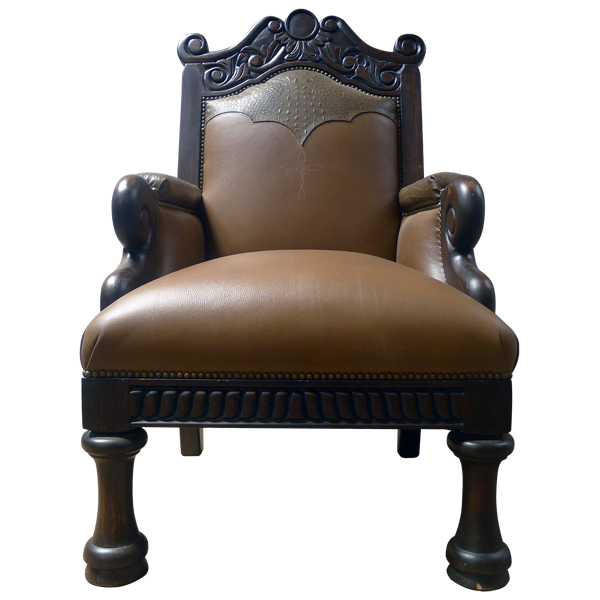 The upper inside seat back is upholstered in contrasting brown, embossed leather in a Western cut design. The sides of the chair and the reverse seat back are upholstered in patterned, real cowhide. The reverse seat back is decorated with leather fringe in a “V” design. The upholstery is painstakingly hand tacked to the entire wood frame by our craftsmen. 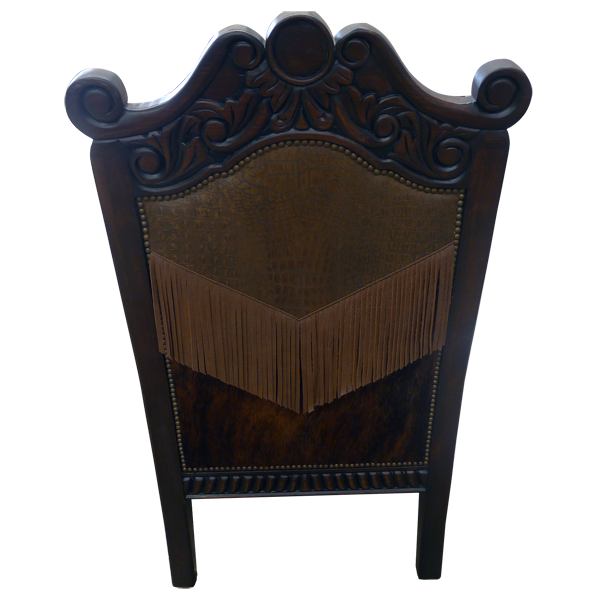 The shield shaped seat back features a hand carved, centered floral design, with exquisite floral details ending in scrolled ends. The armrest are beautifully curved and have hand carved scroll designs. 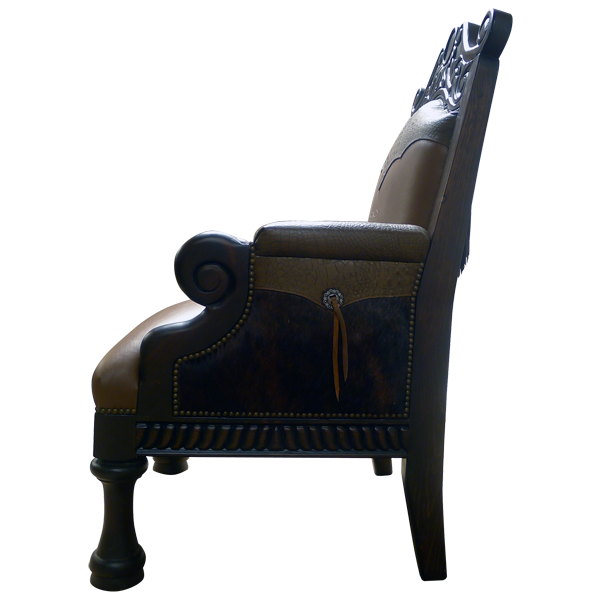 The lateral sides of the chair are decorated with a hand forged iron concho with leather cords. The base of the chair is hand carved with ornate diagonal patterns and floral designs. The chair rest on hand turned, front trumpet legs, and straight, back legs. All sides of the base of the chair are adorned with decorative, hand forged iron nails. The chair is durable and comfortable and is made with the best, sustainable, solid wood available. It is guaranteed for life and is 100% customizable.